FRONT AND REAR DISC BRAKES WITH ABS: Single front and rear disc brakes give the CTX700 DCT great stopping power. You also get anti-lock brakes (ABS) for the best possible stopping power, especially under challenging conditions. DIAMOND SHAPED STEEL FRAME: Light, strong, and with just the right amount of stiffness, the CTX700’s rigid and compact chassis is the foundation for precise handling. PRO-LINK REAR SUSPENSION: Offering 4.3 inches of rear-wheel travel and teamed with a Honda Multi-Action System (HMAS) rear shock, the CTX700 eats up rough pavement while giving you a smoother ride. 670 CC PARALLEL TWIN ENGINE: With its cylinders tipped 62 degrees forward for better weight distribution, the CTX700’s engine is a big step forward in modern powerplant design. The two-cylinder format produces tons of low- and mid-range torque, and the 270-degree-phase crank and uniaxial primary balancer make it smooth, too. 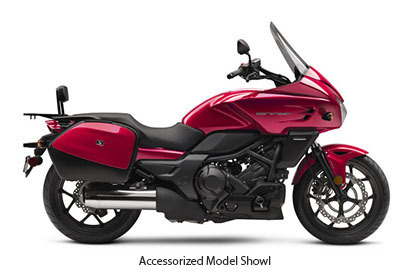 FULL COVERAGE FAIRING: With its full-coverage fairing and windscreen, the CTX700 really adds to your comfort on long trips. The fairing upper and lower components are unique to this model, and are integrated with the rest of the bike. 41 MM FORK: With 4.2 inches of travel, the CTX700 soaks up the bumps and jolts in rough pavement, but also provides excellent handling and superior feedback through the handlebar. CAST ALUMINUM 17 IN. WHEELS: The 17 inch wheels give you a wide choice of premium tires to choose from, and really help the CTX700 handle like a pro on the street. The cast wheels are light and strong, too.